Hallettsville was booming in the early 1900s. 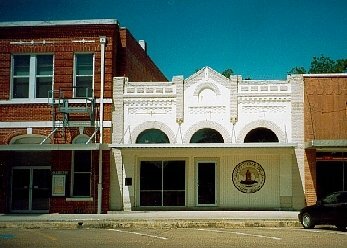 With the construction of a new light system in the summer of 1900, Hallettsville started a nine-year run of development that included the construction of new buildings, the beginning of new businesses, and renovations to existing structures. Extensions were make available so that electric lines could reach the outskirts of town and provide lights for the oil mill and depot. The contract for building the new plant was with the San Antonio firm of W.G. Schurwith & Co. It provided for a 1200 light incandescent power system with a separate circuit for arc lights. In 1903, the city continued to improve when a new ice factory came to town. According to the newspaper, Joseph Schmidt was the owner of the business. There was some haggling over the proposed location of the plant and Schmidt eventually had to change his plans. The complaint over the original location came from the owners of the Lindenberg Hotel. They were upset that the plant would be running around the clock and were afraid that the noise would disturb the hotel guests. Schmidt leased some land from Cornelia McDermott that was located on a lot opposite the jail and behind the San Antonio Brewery warehouse. Evidently this worked out well for all concerned and the ice plant was built. “Every man in Hallettsville and the adjoining country that uses ice should patronize this institution,” wrote the Hallettsville Herald. During the summer of 1909, downtown growth of the city was in full swing. Lay Drug Store was under construction and the paper reported that the foundation had been completed and the east wall erected. The entire floor of the building was covered with tile. The frame building, owned by D.B. Howerton, was being torn down and he was erecting a new brick warehouse next to Lay Drug Store. Observers noted that once Howerton’s building was complete, all structures on the north side of the square would be made of brick. It was during this same period that the Fink Hotel was erected and the brick building occupied by Mrs. B.F. Arnim was being renovated. The paper reported that the S.C. Patton residence had been thoroughly repaired and put in good condition. Also, the Knights of Pythias and Woodmen Hall were nearing completion. “The Bohemian Lodge at this place has purchased a lot and will soon begin the erection of a lodge building. In a few days the city will complete the laying of water mains to portions of town that have been without them,” said a Herald writer. Over the years we have seen many businesses come and go, but the old brick buildings are still standing on the square. Unlike today’s architecture these are structures with character and style, a tribute to the creativity of the men who built them.